LOW Loose controls get in the way of successful platforming. 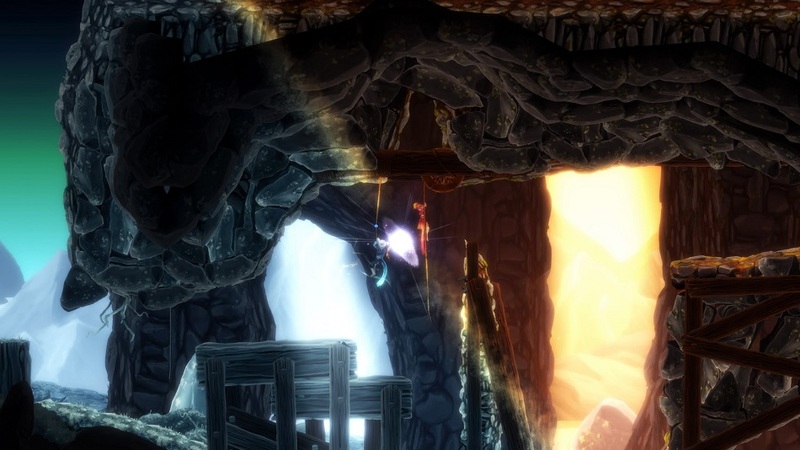 We live in a golden age of indie puzzle-platformers, and we now have one more to add to the pile — Degrees gives players a strong central mechanic, and plays with the space it’s set in. 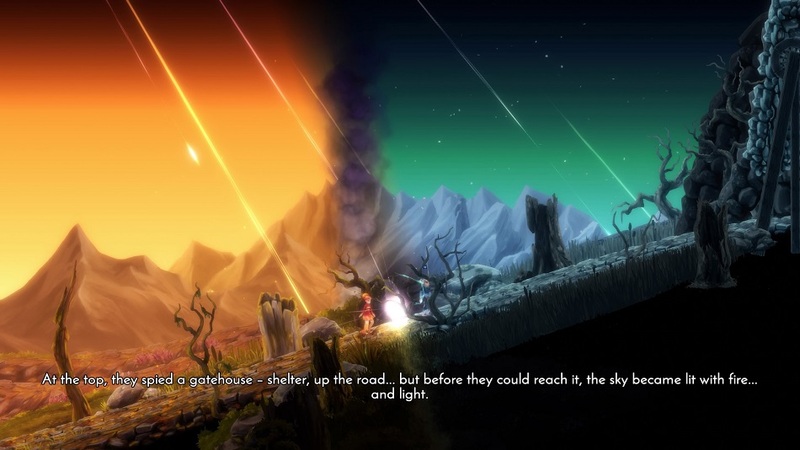 The game follows the story of Ember and Rime, a pair of people with special powers. The world surrounding Ember embodies fire, while Rime freezes things around him. The two meet one day, and are dismayed to learn that the nature of their opposing worlds keeps them apart — unable to even touch. What follows is their quest to be together. 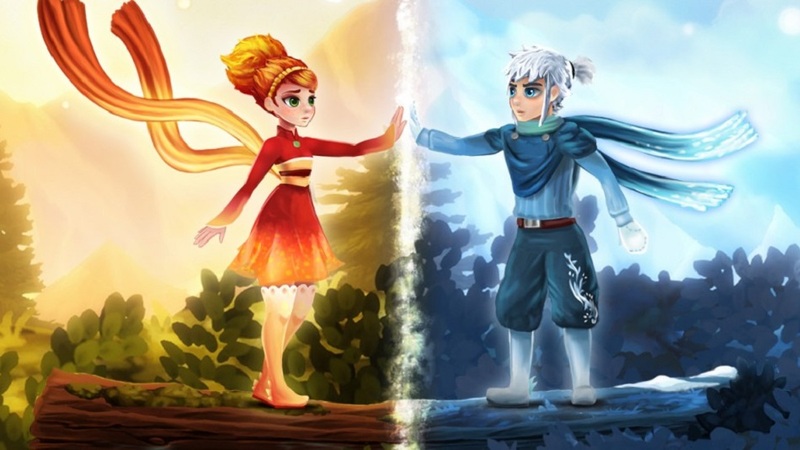 Players use the characters’ opposing elements to solve a variety of puzzles, and the screen is split in half between the two of them — Ember’s flames cover her half, and Rime’s ice covers his. The screen’s division moves depending on their relative placement, so managing the elemental aspects by maneuvering them around each other forms the core of Degrees gameplay, over 100 puzzles strong. Objects affected by Ember experience rising heat. Steam vents up across the map, helping or impeding players. Snow melts, opening new paths. If an object is frozen in place, Ember can free its movement by thawing the ice. Rime’s powers freeze objects instantly, allowing him to walk on water as it turns to ice, and machinery can be frozen to hold it still. Rime’s side of the divide also coats objects in snow, allowing for new platforming opportunities. A small central hub leads to the main areas, and each of these is gated by how many puzzles the player has successfully solved, allowing Degrees to step complexity up at a measured pace. Each level also focuses on a gimmick that fundamentally changes the central mechanic. For example, one world revolves around a cloak that toggles each element off temporarily. Another allows the player to form a bridge of light along the divide, solid enough to walk on. These twists begin and end within one level, and their discrete nature keeps things fresh. In terms of challenge, I’d say that Degrees welcomes players at an approachable medium. I’m personally inexperienced with puzzlers, but I successfully cleared the majority of challenges without co-op help. Luckily, players don’t need to 100% every level to progress, so if there are some sections that are too challenging, it’s possible to bypass them and keep progressing through the campaign. My only complaints are minor ones about execution — the characters have loose controls that occasionally get in the way of tougher platforming. Whenever a puzzle asked for precise jumping or movement, I found the characters often drifted past where I needed them to land. Also, the softness of the art style contributes to an overall visual muddiness that occasionally made it tough to pick up on crucial details. Tighter controls and better visual signposting would definitely elevate Degrees’ quality. 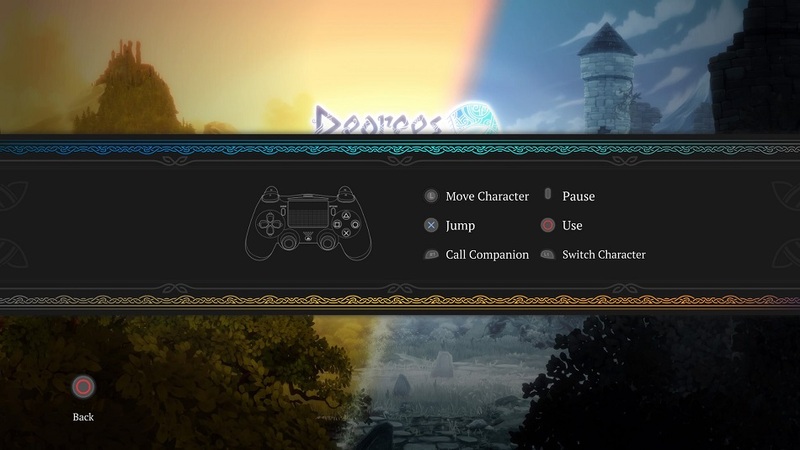 While Degrees supports local co-op (which seems to be the intended way to play) solo players switch control between Ember and Rime to solve puzzles. Thanks to a bit of AI assistance from the non-active character, I found that the campaign was easily finished alone. On most puzzles I never felt the need to have a second player aside from a small handful where the AI got stuck. 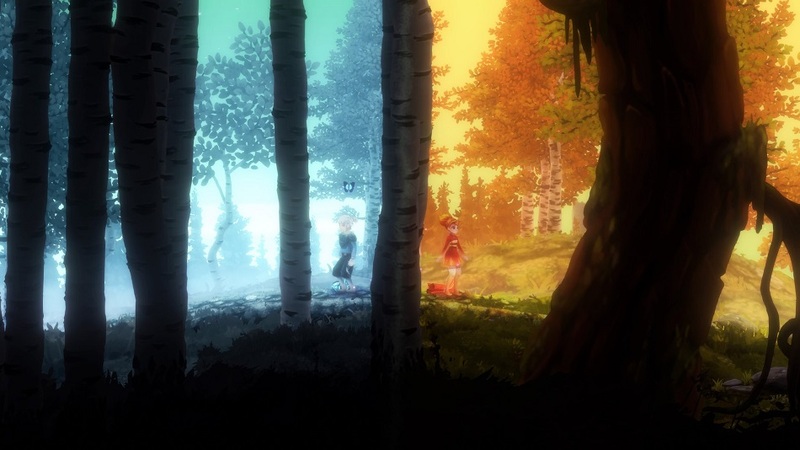 Degrees of Separation sets out to deliver a fairytale-like puzzle adventure, and succeeds. While the overarching plot is slight, the developers take a strong central idea and get players to look at it from all angles. Entertaining, beautiful, and appropriately challenging, I’d recommend this adventure to anyone looking for a peaceful series of brain teasers to explore. Disclosures: This game is developed by Moondrop Studios and published by Modus Games. It is currently available on PS4, Xbox One, PC, and Nintendo Switch. This copy of the game was obtained via publisher and reviewed on the PS4 Pro. Approximately 7 hours of play were devoted to the singleplayer mode, and the game was completed. 0 hours of play were spent in multiplayer modes. Parents: According to the ESRB, this game is rated E, and contains no descriptors. Degrees is safe for kids. There’s extremely minimal violence and no adult language or imagery. Deaf & Hard of Hearing Gamers: There are full subtitles for the narration, which is the only dialogue in the game. No audio cues are relevant to completing the game. It’s fully accessible.